A person who engages in a particular activity simply for the love of it, and is not paid for their work. A person who is competent and skilled in a particular activity, and is paid for their work. When the modern Olympic Games were founded in 1894 by Pierre de Coubertain, Amateurism was at the heart of the games’ values. At the first modern Olympiad in Athens Greece, athletes competed individually and at their own expense. Some of the contestants were even tourists who happened to be visiting the ancient city! The level of mental and physical skill would have varied greatly amongst competitors. Presumably, all participants would have entered the games with a desire to compete and with love for their given sport. At the 1936 Berlin Olympic Games a new invention, the television, turned sport into spectacle for mass consumption. Economic value was generated, general sponsorship was sold and the shift away from Olympic Amateurism began. But here’s where the where the waters muddied. In the 1960’s, Puma and Adidas, owned by feuding brothers, enticed runners to wear their footwear in competition by stuffing thousands of dollars inside the running shoes that were gifted to sponsored athletes. These companies would be of the first companies to use athletes as advertising. When word of this sponsorship reached the IOC, athletes were unrepentant. They were providing publicity for the shoe companies, and wanted to be rewarded for the value they were contributing to sales. The question arose – why shouldn’t athletes be paid for their publicity work for the corporate sector? Why on earth should they work for free? After much dispute within the IOC, athletes were granted the right to receive payment for their work, now well known as sponsorship funding. Amateurism in the Olympic Games was no more. The result? Olympians were now Pros. 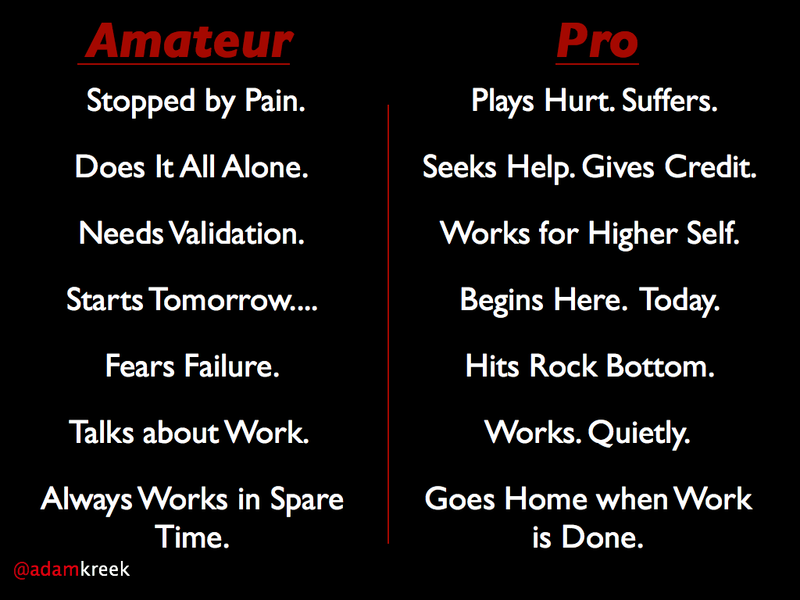 What’s the difference between an Amateur and Professional Athlete? And so it goes, people routinely confuse amateurism with professionalism. I.e., I love to run, therefore running professionally would be fantastic. Whilst a love of sport may have sparked their journey, few Olympic athletes can make it to the games fuelled solely on a love of sport. Most athletes have to push through tremendous self-doubt, and extremely low wages to compete with the world – often only a couple times a year. So then, if the pay is poor, the play not often and the preparation constant, then why on earth do these individuals keep working? The pursuit of Olympic excellence is far greater than an amateurish ‘joy of play’. Professional athletes commit to a given profession and find fulfillment in giving their best work every day. It’s not all about ‘what’ they are doing, and rather, it’s about how they do it. They seek and find enjoyment in work and disciplined action. Lasting love of their profession comes from an interest and curiosity in human potential; the fulfillment experienced on the path to skill development; the enjoyment garnered from a relentless flow of positive energy acquired when striving for measured success; the vast learning that occurs when one pushes beyond their perceived limits; the confidence that wells within when we accept responsibility for personal success and failure. The bulk of work undertaken by an Olympic athlete you see standing on the podium is done off the racecourse, field or ice. Most athletes spend little of their time ‘playing’ their sport, or experiencing the thrill, joy and excitement we see when the cameras are rolling and athletes are at their peak. The bulk of of a professional athlete’s time is spent repeating monotonous tasks and skills over and over until peak performance is achieved. And they show up. Always. 6 to 7 days a week, and give 100%. They feel sick? They show up. They are tired? They show up. It’s a holiday – what’s that? Now more than ever in history, athletes conduct themselves professionally day in and day out. Unceasing grit and professionalism is what powers the Pros to the opening ceremonies and onto the podium. Love started their journey, but Professionalism finishes it. Professionalism is a choice and these traits can be learned. When you dedicate yourself to your work and commit to give your best performance routinely, you will find invaluable fulfillment and motivation to continue. The joy you find in personal development and skill enhancement cannot be given or taken away by anyone. You create your achievement and you reap the benefits. A Professional choses to exist in an environment that rewards effort and tracks performance. Successful Professionals are internally motivated and their harshest critic and fan. Work hard and take pride in your work. Have amateur pursuits to restore your soul. If you are to be paid for your work, embrace the traits of the Pros. You will reap the benefits, both personally and financially. Are you ready to be a Professional?